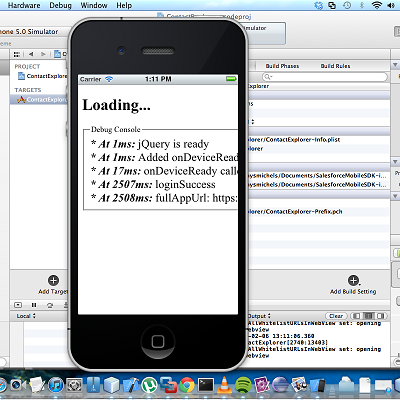 We will now create a Hybrid Iphone App. Note: Remember the newly created consumer key cause you will use it the bootstrap.js file. // your application in Salesforce. // The authorization/access scope(s) you wish to define for your application. // http://[host]/[pagePath]. Leave blank to use the local index.html page. var startPage = "apex/SalesKing";  // Used for local REST-based"index.html" PhoneGap app. // generally a good idea. Step 6: Run your application. It will prompt you to login to Salesforce using your Salesforce username and password. Step 7. It will ask to allow or deny access to the application you specified in step 1. Click ‘Allow’ to access the application.